How Will Sutton Realty Get The Maximum Value for My Home? Your Realtor at Sutton Group Realty Systems is prepared to List and Sell your home with an extensive marketing plan. We've got you covered, from professional photography and virtual tours, to a live concierge tracking the showings of your home. How Much Has The Value of Your Home Increased? Simply enter your criteria below, and we will provide you with a speedy response. Ready to talk to an Agent now? Call 905-896-3333 or 416-896-3333 to speak to a live representative. We are happy to assist you. Note: Due to Canada's privacy laws, you must be the actual home owner to receive this comprehensive evaluation. Thinking of Selling Your Home? Think Sutton For Outstanding Results! Sutton sells your home faster and for more money just check our averages when stacked up against the Toronto Real Estate Board Average. We Sell Homes Faster! 14 Days faster to be exact. The average Realtor on the TREB will sell your home in 22 days, while the average of a Sutton Realtor is only 8 Days. We Sell Homes for More Money! Our Sutton Group Realty Systems Agents sell homes for an average of 116% of the asking price while the TREB average is 102% of asking. Our Brokerage, Sutton Group Realty Systems, was the very first Sutton in Ontario 1988. In addition, Sutton is a national Real Estate Company with over 190 offices across the country. Sutton Group Realty Systems is one of the leading top producing Sutton Offices. Our award winning agents will not disappoint! Thinking of selling your home? Get a free no obligation online home evaluation OR call us at 905-896-3333 or 416-896-3333 for over the phone evaluation. Need to refinance your mortgage? Contact us and ask for our mortgage specialist. Thinking of listing your house for sale with a Sutton Agent? Call our Sutton Toronto Office 416-896-3333 or Sutton in Mississauga 905-896-3333 to find a Sutton Real Estate Agent. 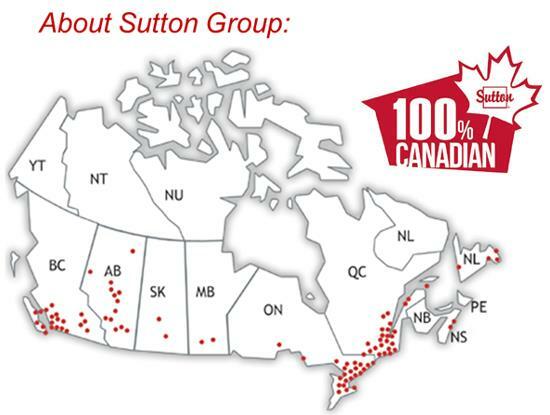 Sutton is proud to have over 8,000 professionals across Canada to serve you real estate needs. Looking for a Low Real Estate Commission Rate? Flexible Real Estate Commission Plans. Ask to see our Sutton Realty Systems Commission Plans - You pick the flexible plan that suits you. We also offer a full service plan which includes helping your sell your home or for investors we can help you rent a property. Residential and Commercial real estate sales representatives and brokers to assist. Sutton Real Estate offices serving Toronto, Mississauga, Oakville, Brampton, Oakville, Burlington, Hamilton. Call us today to receive a Free Market Evaluation with Sutton Realty. Brokerage Member of the Toronto Real Estate Board, Oakville & Milton Real Estate Board, Hamilton and Burlington Real Estate Association, Canadian Real Estate Association, Ontario Real Estate Association. Thinking of Selling your Home Privately in Toronto, Mississauga, Brampton or Oakville? Over the phone Private Seller Tips. We'd be happy to give you a second opinion. We understand that You know your house best and respect a Sellers decision to sell a home privately. If you would like to take full advantage of the MLS System, let us explain the full benefits and tips on how we utilizing the internet to locate buyers for your home. Simple techniques can make a huge difference in the way your listing is viewed by consumers and other realtors. We find the market has changed dramatically over the past 2 years, each month brings new changes. We keep abreast of the new trends in the market and keep our sellers informed. We consider an MLS Listing is like a "work of art" - each consumer has a different view of a home. Nothing can be overlooked, what you may take for granted may be extremely valuable for another. Preparing for the Offer Presentation with our Sellers in advance makes for a smoother sale. Understand the clauses within the typical offer. The pro's and con's of conditional offers. What you can do to assist in firming up conditions faster so you know you have a firm sale. Understand the fine print, the importance of a deposit, the strength of an Agreement of Purchase and Sale.